Bottlebrush?? Whats this? 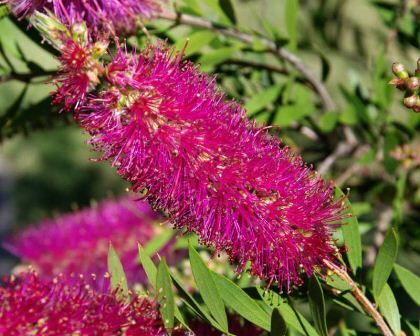 Looks like some sort of bottlebrush to me, but I thought you Aussies might have a better idea of which variety it is. Callistemon Mauve Mist My Mauve Mist Callistemon has never flowered the bush is growing very well lovely green leaves rather tall bush, in a sunny position. No flowers been in ground for several years. My Mauve Mist Callistemon has never flowered the bush is growing very well lovely green leaves rather tall bush, in a sunny position. No flowers been in ground for several years. #1. Not enough sunshine - they need a full sun location though a little shade throughout the day is OK too. But yours seems to be correctly placed. #2. Make sure it is getting balanced fertilisation. It sounds like its getting plenty of nitrogen (green leaves) but that can sometimes encourage all its energy to go to leaf production at the expense of flowers. Best to use a 'Native' formulated fertiliser like 'Bush Tucker' - see link below. #3. Regular tip pruning is good to encourage bushy growth but you must be careful not to prune prior to flowering, as the new buds will be cut off and generally the shrub won't produce more until next season. Sounds like #2. or #3. for you Helen. And this is what the blooms will look like once you've got your maintenance regime right. Worth waiting for Helen.